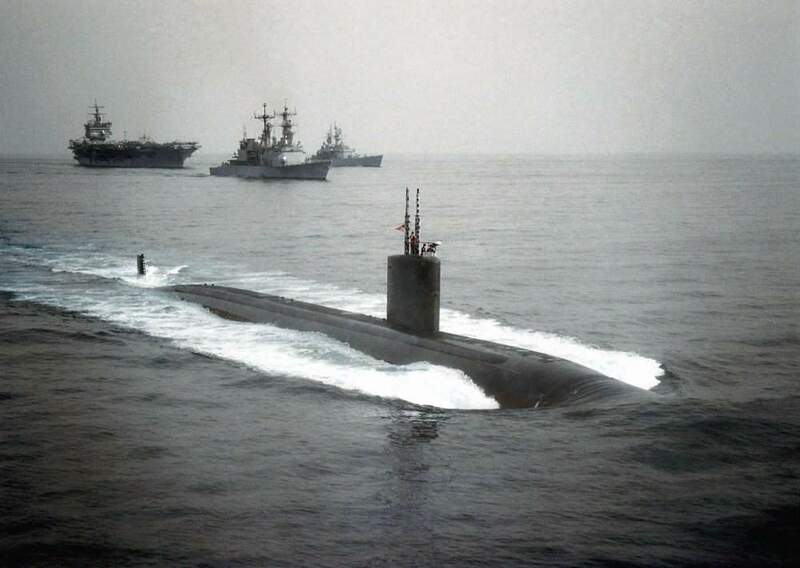 Los Angeles Class (Improved) Attack Submarine: Laid down, 21 September 1987, at Newport News Shipbuilding and Dry Dock Co., Newport News, VA.; Launched, 17 August 1990; Commissioned, USS Jefferson City (SSN-759), 29 February 1992. 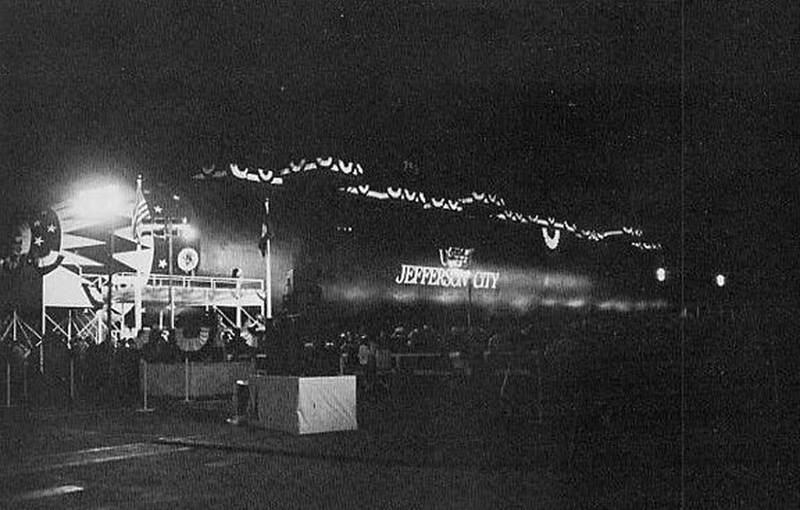 Jefferson City is assigned to the US Pacific Fleet and is homeported at San Diego, CA. 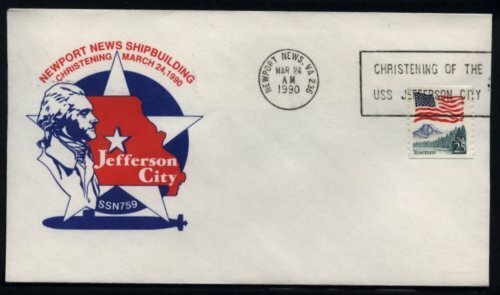 25k Commemorative postal cover issued on the occasion of the Christening ceremony of Jefferson City (SSN-759), 24 March 1990. Courtesy of Jack Treutle (of blessed memory). 273k Jefferson City (SSN-759) lit by the night on 17 August 1990. 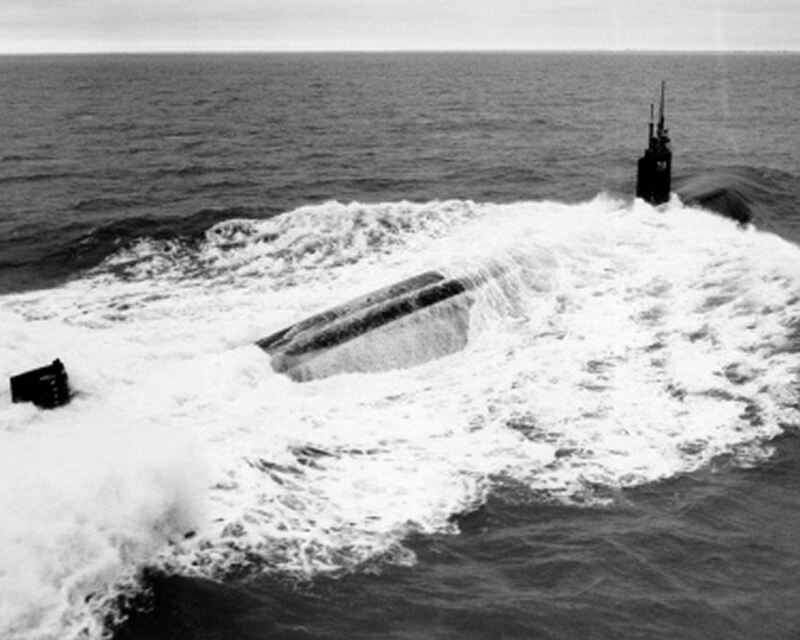 82k Jefferson City (SSN-759) underway, during her alpha sea trials off the Atlantic coast, 1 November 1991. USN photo. 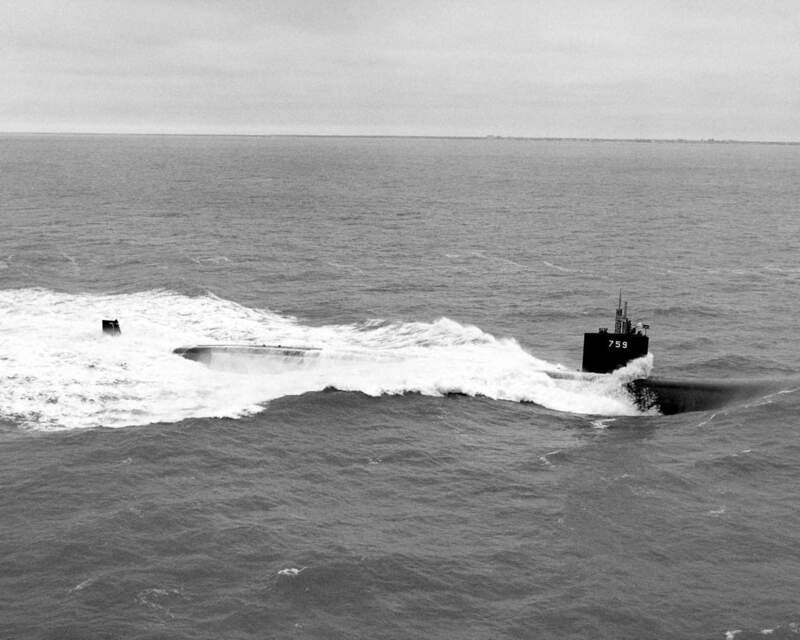 152k A starboard beam view of the nuclear-powered attack submarine Jefferson City (SSN-759) underway off the Virgina Capes during sea trials on 1 Novbember1991. USN photo # DN-SN-92-10236 by Chris Oxley, from the Department of Defense Still Media Collection, courtesy of dodmedia.osd.mil & submitted by Bill Gonyo. 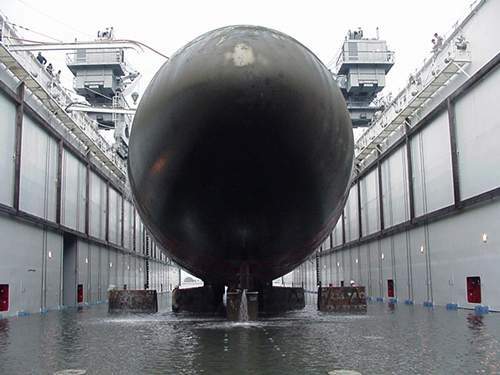 319k A port quarter view of the nuclear-powered attack submarine Jefferson City (SSN-759) underway during sea trials off the Virginia Capes. USN photo # DN-SN-92-08768 by Chris Oxley, from the Department of Defense Still Media Collection, courtesy of dodmedia.osd.mil & submitted by Bill Gonyo. 1.21k Twelve page Welcome Aboard PDF of the Jefferson City (SSN-759), 29 February 1992. 61k The US Navy's nuclear powered fast attack submarine, Jefferson City (SSN-759) (bottom) leads the pack during joint navigational manuvers with the aircraft carrier Enterprise (CVN-65) (top left), the Spruance class destroyer Hewitt (DD-966) (top center), and the nuclear powered cruiser California (CGN-36) (top right), during operations in the Persian Gulf. Enterprise arrived in the gulf to join forces with the aircraft carrier Carl Vinson (CVN-70) (not shown) and her task group, in support of Operation Southern Watch on 22 September 1996. USN photo # DN-SD-01-09973 by PH2 Matthew Hostetler, USN, from the Department of Defense Still Media Collection, courtesy of dodmedia.osd.mil & submitted by Bill Gonyo. 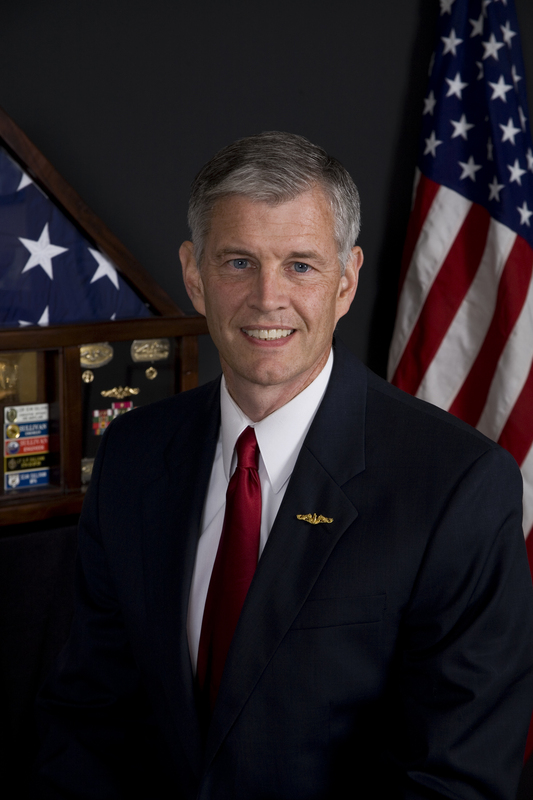 130k Congressman Sean Patrick Sullivan became commander of the Jefferson City (SSN-759) in 1996. 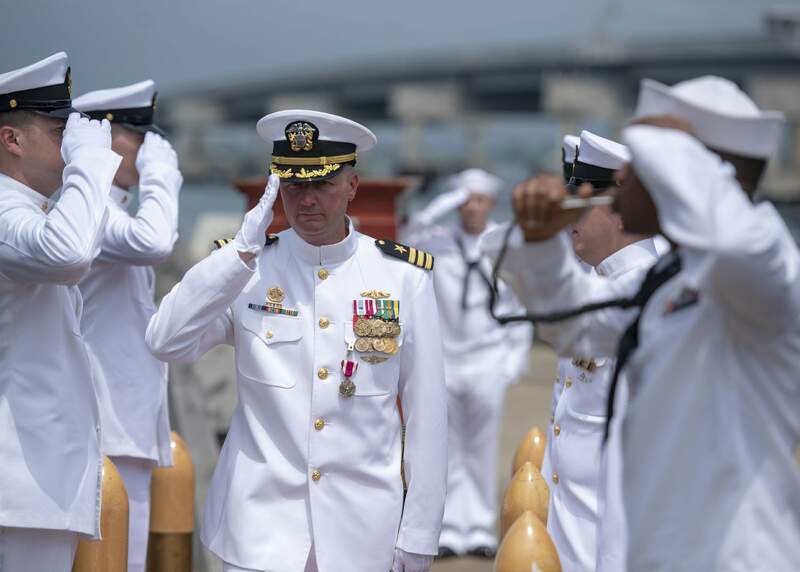 By the time of his retirement from the Navy, he achieved the rank of Commanding Officer of the Naval Submarine Base in New London. He retired from the Navy with the rank of Captain. Photo from the Sean Sullivan for Congress campaign & submitted by Bill Gonyo. 99k Military Photographer of the Year Winner 1999 TITLE: "Are You Being Served?" First Place Illustrative. (SS) Yin Lau brings food to the crew anytime and anywhere. 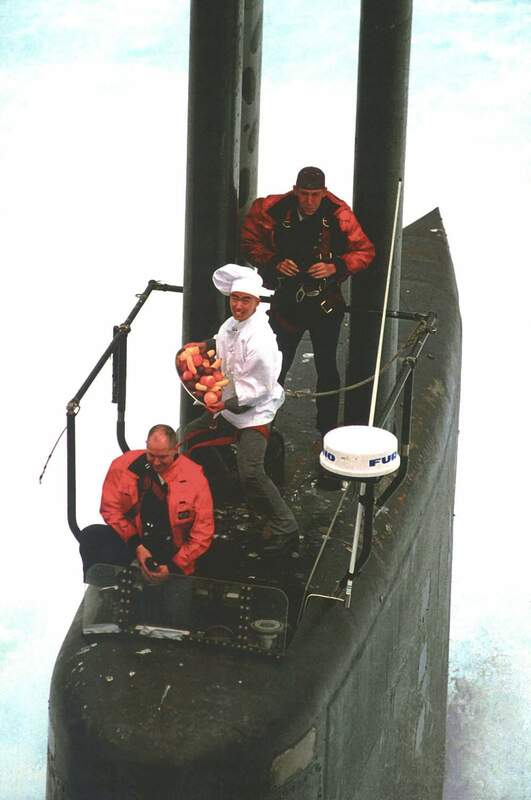 Here he stands on the bridge of his undersea kitchen, Jefferson City (SSN-759), on 1 January 1999. USN photo # DD-SP-01-00014 by PH2 Aaron Ansarov, from the Department of Defense Still Media Collection, courtesy of dodmedia.osd.mil & submitted by Bill Gonyo. 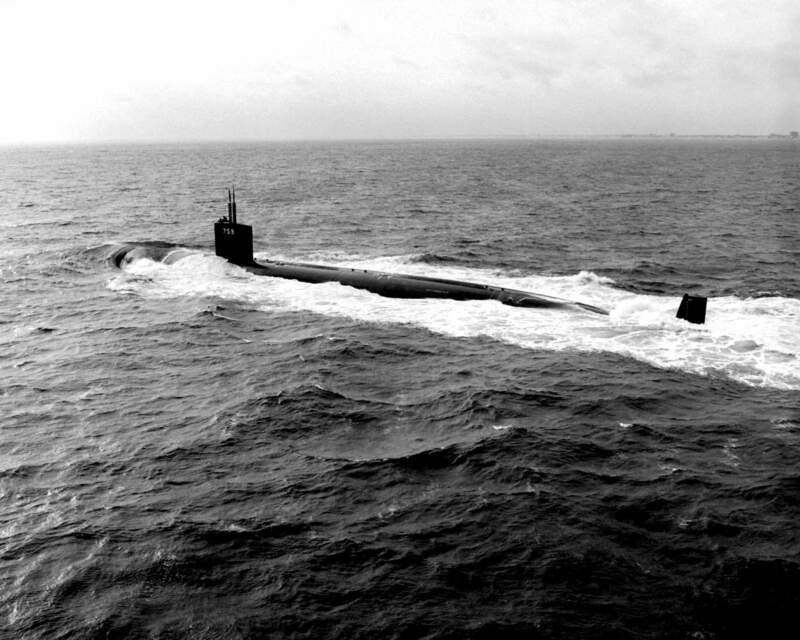 3.07k Forty page Commissioning PDF of the Jefferson City (SSN-759), 1999. 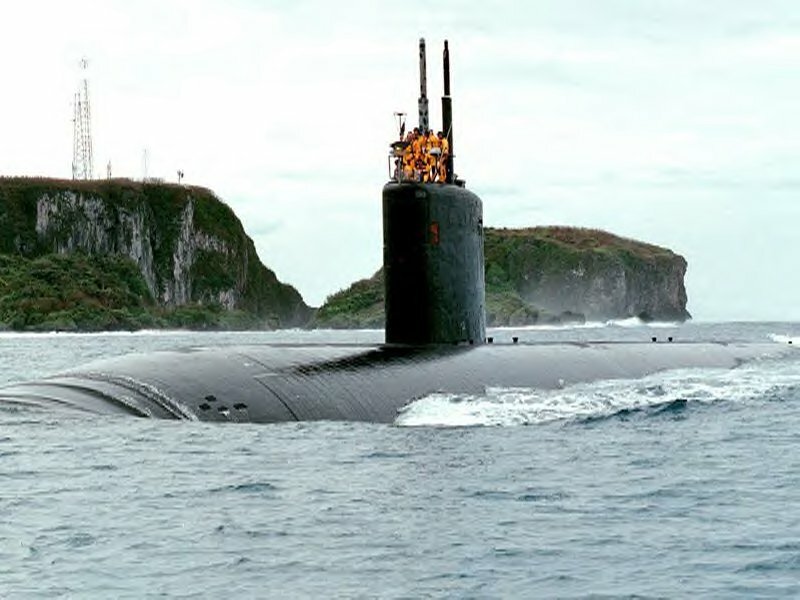 75k Jefferson City (SSN-759), off Santa Rita, Guam, 25 January 2000 as the submarine enters Apra Harbor, Guam. USN photo # N-9885M-003 taken by PH1 Alan D. Monyelle. 27k On the 17th of October 2000, the Navy Submarine Base San Diego was host to one of the Navy's most unique evolutions. 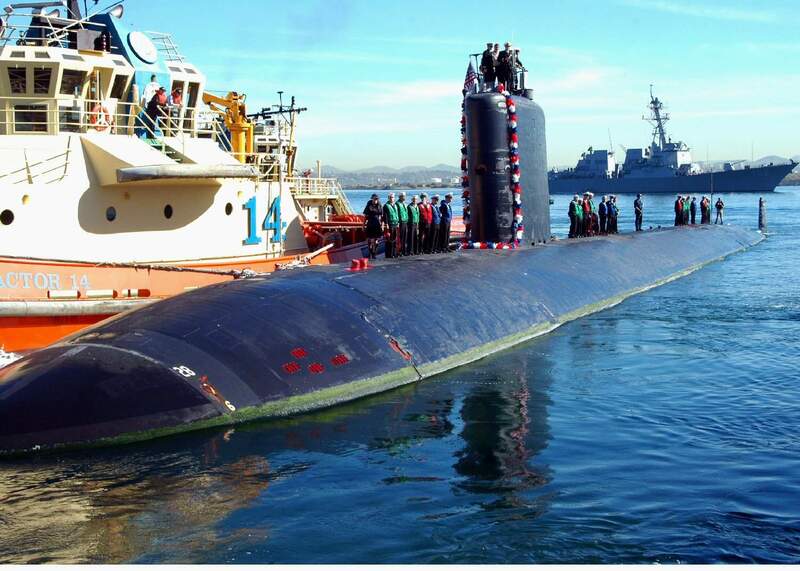 Arco (ARDM-5) successfully docked Jefferson City (SSN-759). This was the first time Arco has seen a submarine in over 15 months. An extraordinary amount of time and work went into the planning of this evolution by the sailors of Arco. The hundreds of hours put into preparing for such a large evolution was the sole reason the docking was conducted without complication. The Jefferson City is scheduled to be in Dry Dock for two months while it undergoes several upgrades. USN photo & text by LT.J.G. Vernon, courtesy of news.navy.mil. 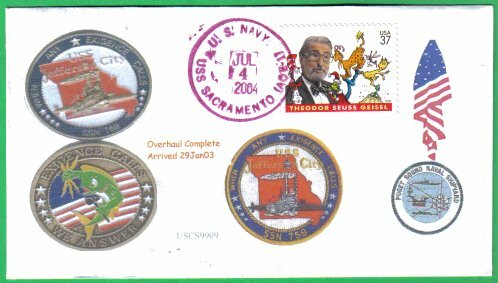 25k Commemorative postal cover issued on the occasion of the completion of the overhaul of the Jefferson City (SSN-759), 4 July 2004. Courtesy of Jack Treutle (of blessed memory). 360k The crew of the attack submarine Jefferson City (SSN-759) takes part in the opening ceremony for Sea World San Diego's new submarine-themed otter and sea lion adventure show, "Deep, Deep Trouble", 19 March 2005. Commanding Officer, Jefferson City, Cmdr. Daryl Caudle and his wife christened the new attraction. USN photo # N-0685S-001 by Photographer's Mate 3rd Class Jo A. Wilbourn Sims, courtesy of news.navy.mil. 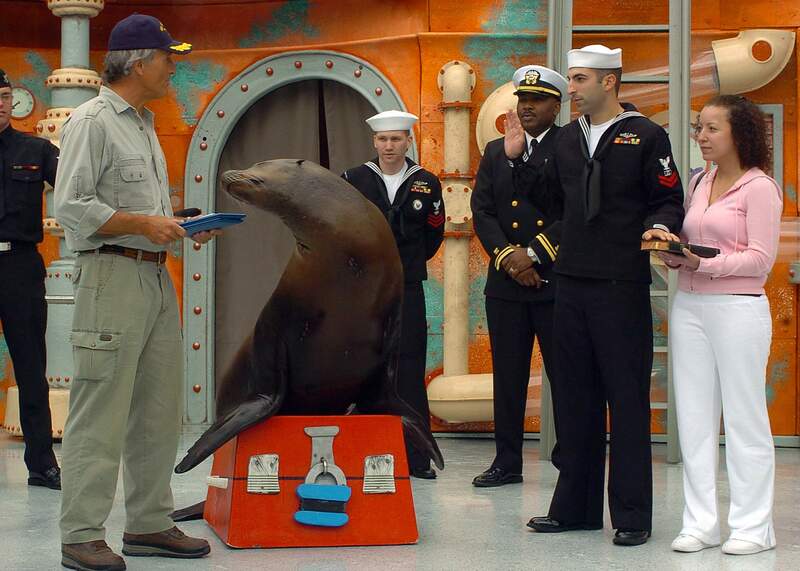 308k Jack Hanna, host of Jack Hanna's Animal Adventure, reenlists Culinary Specialist 2nd Class Richard Youhan with "Seamore," the sea lion. 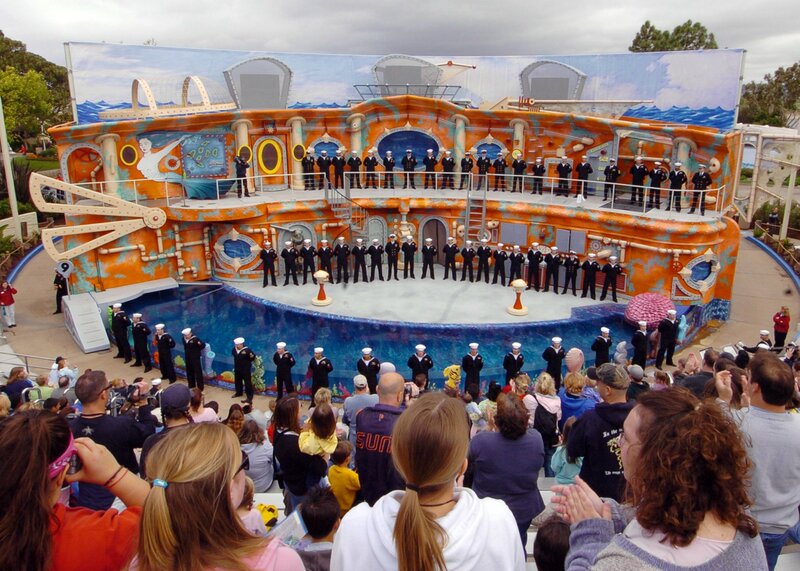 Youhan and the crew of attack submarine Jefferson City (SSN-759) takes part in the opening ceremony for Sea World San Diego's new submarine-themed otter and sea lion adventure show, "Deep, Deep Trouble", 19 March 2005. USN photo # N-0685S-014 by Photographer's Mate 3rd Class Jo A. Wilbourn Sims, courtesy of news.navy.mil. 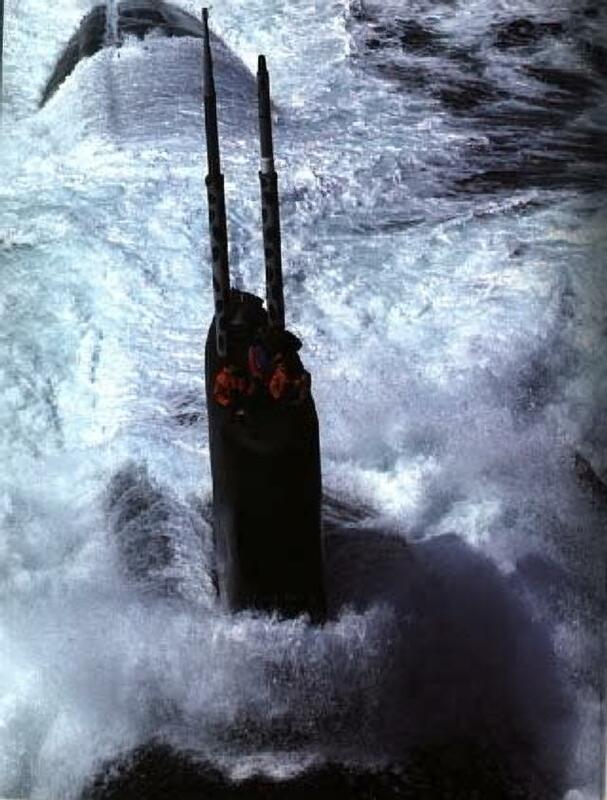 206k Seagulls enjoy a ride on the stern of the attack submarine Jefferson City (SSN-759) while underway near San Diego Harbor 27 April 2005 after conducting routine operations in the Pacific Ocean. USN photo # N-7130B-047 by Photographer's Mate 3rd Class Aaron Burd, courtesy of news.navy.mil. 370k Sailors assigned to Jefferson City (SSN-759), moor pier side at Naval Submarine Base Point Loma, 1 May 2006. Jefferson City recently returned from a deployment conducting operations in the Western Pacific area of operation. USN photo # N-8033C-079 by Photographer's Mate Airman Hermes Crespo, courtesy of news.navy.mil. 119k U.S. Navy Cmdr. 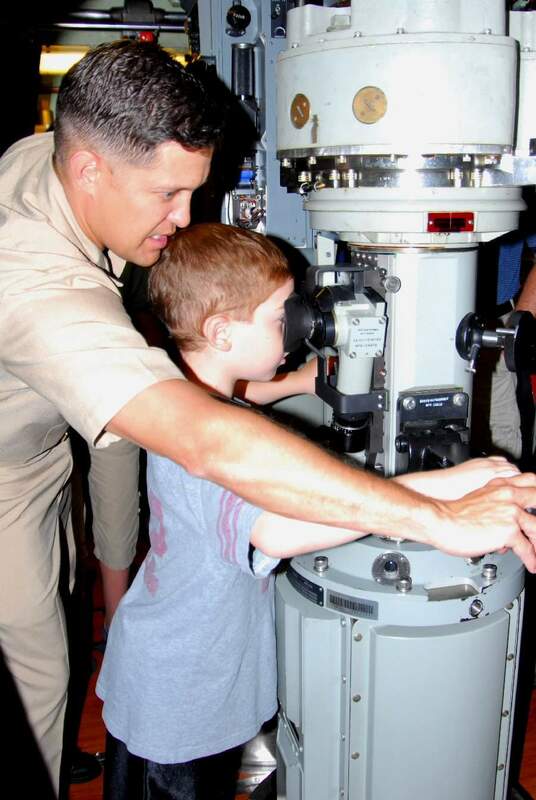 John Zimmerman, the commanding officer of Jefferson City (SSN-759), helps Bobby Carpenter use the submarine's periscope 31 August 2007, as part of a tour in San Diego, Calif., sponsored by the Make -A- Wish Foundation. USN photo # N-4995K-055 by Mass Communication Specialist 3rd Class Chelsea Kennedy, courtesy of news.navy.mil.& submitted by Bill Gonyo. 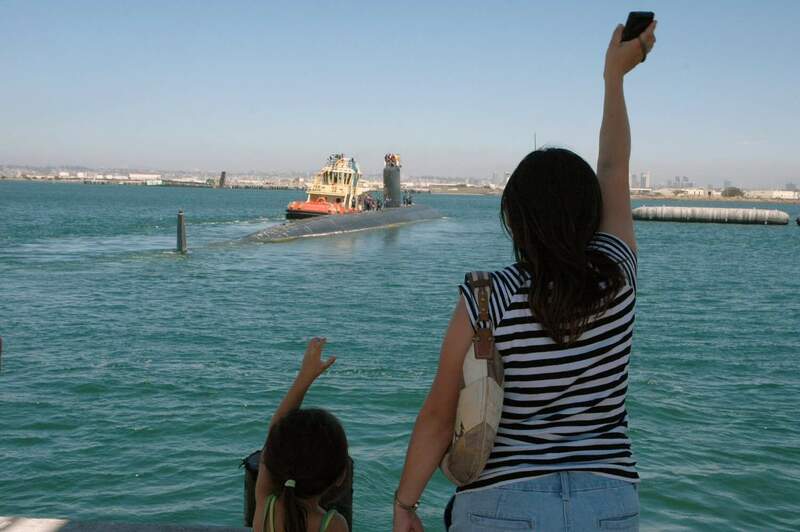 367k Family members of Jefferson City (SSN-759) crew wave goodbye as the submarine begins a a six-month deployment to the Western Pacific, 11 September 2007. USN photo # N-0946B-003 by Mass Communication Specialist 1st Class Kristina Brockman, courtesy of news.navy.mil. The C-Tractor-14 helps guide the attack submarine Jefferson City (SSN-759) to homeport in Point Loma, Calif., after a six-month Western Pacific deployment on 10 March 2008. The Sampson (DDG-102) is off the boat's stern. 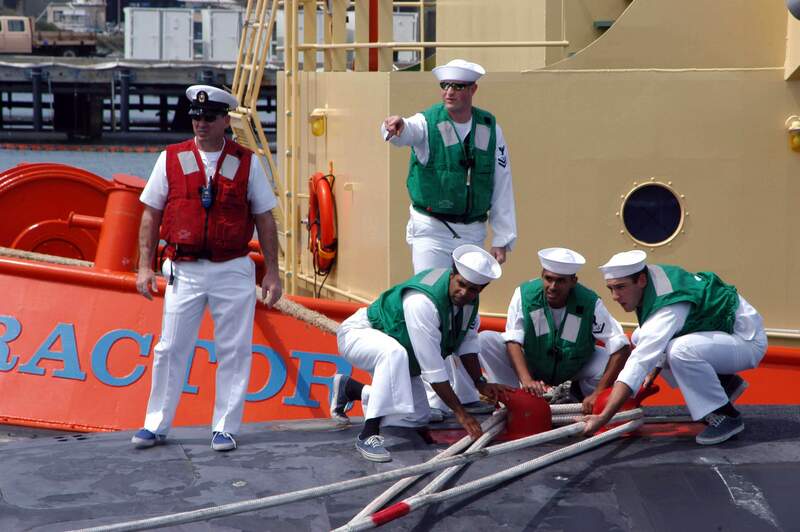 USN photo # N-8909B-007 by Mass Communication Specialist Seaman Apprentice Cale Bentley, courtesy of news.navy.mil. 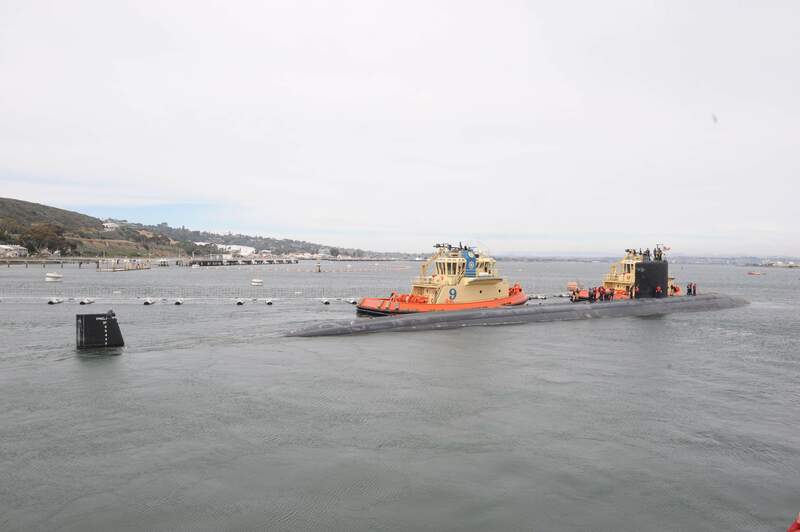 716k The Jefferson City (SSN-759) returns to its homeport of San Diego on 15 March 2012 after a six-month deployment supporting the Chief of Naval Operations' Maritime Strategy, which includes maritime security, forward presence, sea control and power projection. USN photo # 120315-N-HG315-002 by Mass Communication Specialist 1st Class Shannon Warner, courtesy of news.navy.mil. 787k The Jefferson City (SSN-759) departs San Diego for a deployment on 9 April 2014. USN photo # 140409-N-NB544-055 by Mass Communication Specialist 2nd Class Kyle Carlstrom, courtesy of news.navy.mil. 789k Cmdr. John L. Croghan, left, relieves Cmdr. John L. Croghan, right, as commanding officer of the Jefferson City (SSN-759) during a change of command ceremony at the Battleship Missouri Memorial on 12 February 2016. USN photo # 160212-N-LY160-125 by Mass Communication Specialist 2nd Class Michael H. Lee, courtesy of news.navy.mil. 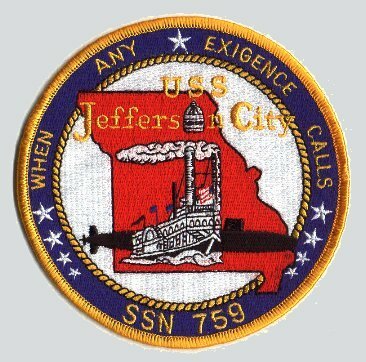 There is no DANFS History currently available for Jefferson City (SSN-759) at the Haze Gray & Underway Web Site, the main archive for the DANFS Online Project.